We proudly are multi vendor or a vender neutral company. We currently deal with Toshiba, Muratec, Lexmark, Xerox and Sharp. Our thought is for about any application, one of these will work. There are a lot of copiers out there, and we help you figure out the right one to go to. With the Toshiba copier line, you have another wide range of choices. If you took all of the copiers we sold, you would have over 300 different devices, this is why you need to purchase from an expert. 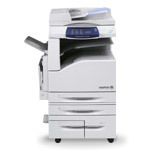 We ensure you purchase the copier that will work for your needs. We would love to help any client in need of a copier here in the Seattle area!